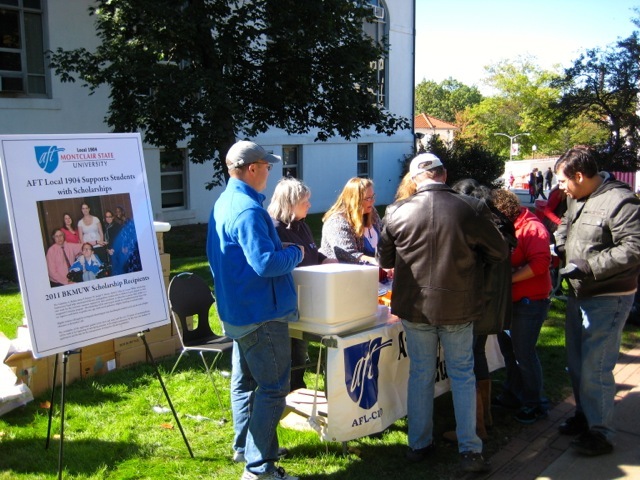 AFT Local 1904 was at Homecoming again this year, minus the snow. We gave out bottles of water, anti-bullying wrist bands, pens, notepads, AFT key chains and many other goodies to the Alumni, students and their families. Many of the Alumni and parents, who are teachers, were very grateful for the anti-bullying bands because they are currently doing units in their classes about bullying. We had enough for them to take back to their students and what teacher doesn't need free supplies? Our banner at the table was also timely. 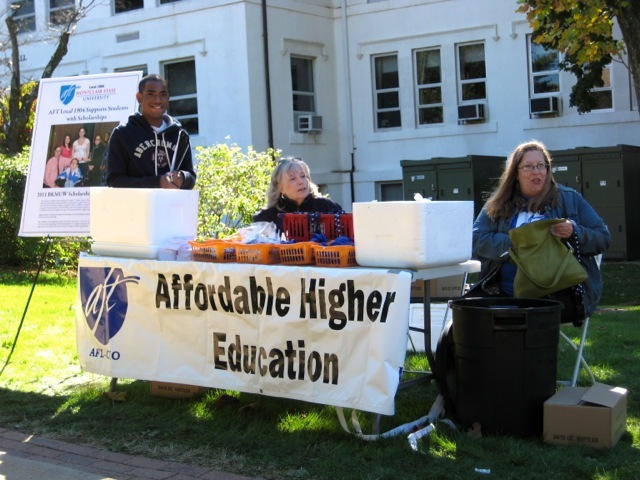 In case you missed it, the issue of affordability of higher education was in the news this weekend. College tuition in New Jersey is rising faster than the rate of inflation. Read more about it in The Star-Ledger. We also spent time letting the campus community know about our efforts to support our students through the BKMUW Scholarship. The students who stopped by our table were excited to learn more about the award which the Local awards annually. Many thanks to our member and student volunteers who spent 5+ hours on a sunny, but chilly afternoon greeting the Homecoming attendees. A good time was had by all. This Election Matters to AFT Members. The Bond Issue on the ballot this November is a rare case where the needs of the administration are precisely aligned with the needs of the faculty, professional staff, librarians, and, indeed, anyone who works here at Montclair State University, or participates in our programs, academic and otherwise. AFT Local 1904, the Council of New Jersey State College Locals, and AFTNJ are all committed to doing what we can to help pass this referendum. We should all vote "Yes" on the Bond Issue, to secure the $240 million that will be our sector's share of the proposed bond issue. Let us take advantage of this opportunity to work together towards an important common goal. The ratification ballots were counted yesterday, October 3rd, and the vote is official: Our tentative agreement has been ratified and all provisions are immediately in effect. We have yet to hear from the Administration as to when increments will be credited and retroactive checks will be sent. Our negotiating team is organized and ready to negotiate items as required by the new contract. For instance, we have asked the administration for a Spring Sabbatical program now that the contract is official. Although we have yet to hear from them concerning the spring program, we now know there will definitely be a sabbatical program for 2013-2014, so it's time to start putting together those applications. There are other areas that we are also pursuing negotiations on such as the Winter Closure and Friday after Thanksgiving. The team is ready and waiting for the administration to respond to our request for dates to sit down and discuss these items and many others. Please come to the next General Union Meeting next Wednesday, October 10th at 2:30 p.m., SC 419, where we'll have answers to most of your questions and more.